Learn how to enrich, support and empower women throughout the incredible journey of pregnancy and childbirth. Asana for Each Trimester. Learn what is beneficial and potentially harmful during each stage of pregnancy. Adjustments & Modifications for Pregnancy. Learn how to incorporate props and modification naturally into your teaching to meet a variety of needs. Practice approaches to adjustments during pregnancy. Anatomical and Physiological Changes. A pregnant body goes through truly amazing physical changes in the pelvis, spine, soft tissue and hormones. We utilize state of the art anatomy technology to enhance your learning of this topic. Yogic Philosophy & Meditation. The immense physical, emotional and spiritual changes throughout pregnancy are often life altering. We discuss the yogic view on pregnancy and practice meditation techniques to promote clarity, peace and strength through change. Pranayama and Breathing Techniques. Breath plays a vital role in regulating our physiology, mental state, emotions, and the ability to be present and clear. Learn techniques to deepen the understanding and conscious utilization of breath for pregnancy and labor. Teaching Methodology. This includes sequencing, creating classes, themes, strategies for incorporating pregnant students into non prenatal specific classes, strategies for meeting the needs of each student in prenatal classes as well as a host of other topics that arise in class discussion. Overview of Postpartum and Caregiver/Baby Yoga. This postpartum period has unique characteristics. Learn how to best support students in their changed bodies, minds and hearts through yoga. Includes approaches to classes for baby/caregiver as well as caregiver only classes. Design Your Own Prenatal Classes. Implement what you learn into your own class designs. Receive individualized feedback from experienced prenatal teachers. Gain Prenatal Teaching Experience. We learn best and gain confidence by teaching. We have structured teaching exercises to assist you in practicing what you love. Bhakti White is a mother, wife, teacher, writer and dedicated student of Shoshoni’s H.H. Shambhavananda. Bhakti is an E-RYT 500, RPYT and YACEP certified Yoga Teacher and C-IAYT Yoga Therapist, Pilates, Meditation teacher and Health and Wellness Coach. 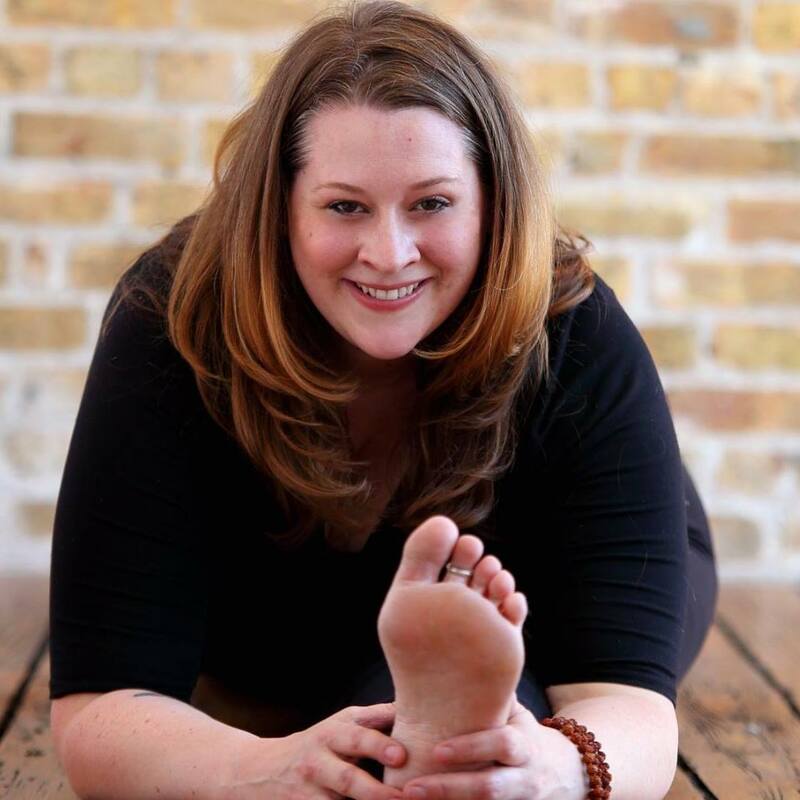 She is the founder of Chi-Town Shakti Yoga + Meditation in Chicago, as well as serving as the founder and board president of CSGSY The Chicago Ashram for over seven years. She has taught over 12,000 public classes and served as the lead trainer on more than 35 Yoga Teacher Trainings in the United States. Bhakti can also frequently be found advocating for body positivity, as model or writer, on the pages of Yoga Journal Magazine and content contributor to Gaia’s online publications and videos. Her special love is for supporting women’s health and particularly those making a transition into motherhood. In her prenatal Teacher Training’s you will find the skills to emotionally, physically and energetically support those making one of the biggest transitions life has to offer. It’s always a special gift and honor to be a part of someone’s journey into parenthood and Bhakti feels grateful and lucky to help others facilitate that journey. *All prices include tuition, meals & lodging. *If choosing gluten free meal option, a $75 fee will be added to your training cost. A $300 deposit is due to secure your space in the training. The remaining balance is due by your training start date. This training begins Saturday, June 1 at 1:15pm and ends Wednesday, June 12 at 1pm. There will be one full day off during the training on Friday, June 7. There are no required classes on that day, but trainees are still welcome to stay at Shoshoni for meals and participate in scheduled guest classes for no additional charge. 5:30-7:00 Personal Practice and Meditation. Arise with the dawn! Gather with other teacher trainees and Shoshoni teachers to wake up with your own asana practice and sit for silent meditation as a group. There is the option to experience the Guru Gita chanting or Vedic Fire Ceremony. 7:00 Breakfast. Meals are a special part of the day to nourish and relax with the Shoshoni community. And yes, we do serve coffee! 8:00-9:45 Training Workshop. Meet in the Yoga Mandir for a special topics class. Topics include teaching methods, pranayama, anatomy and practice teaching. 10:00-12:00 Yoga and Pranayama Class. 3 days per week, be inspired by the Shoshoni teaching staff as you experience a wide variety of yoga and pranayama classes. 12:00 Lunch. Our delicious vegetarian meals includes organic veggies from our greenhouses! Menus range from Asian to Italian to American. Gluten-free, vegan meals may be requested on your reservation. 1:00-1:30 Seva. Experience yoga in action as you practice selfless service (dishes, cleaning, etc.). 1:45-3:45 Training Workshop. Return to the Yoga Mandir for an in-depth asana workshop including anatomy and practice teaching. 4:00-5:00 Optional Evening Yoga. Attend yoga with the Shoshoni community, if you like. Or enjoy free time until dinner and meditation. 5:00 Dinner. Another delicious meal. Dessert is served with dinner on the weekend. 6:15-7:30 Philosophy and Meditation Class. The day draws to a close with meditation practice and yoga philosophy discussions. On the weekends, join the Shoshoni community for Kirtan and Meditation in the Main Temple.